Blue Blood reports that artist Nicole Dextras is making ballgowns of flowers and leaves. Outfits appropriate for all your dark fae major events. I am not usually a fan of art which is fleeting or the whole schtick of destroying what one has created. One of the reasons I shoot is to give some permanence to the ephemeral. But artist Nicole Dextras is doing some really exceptional work in vanishing work. 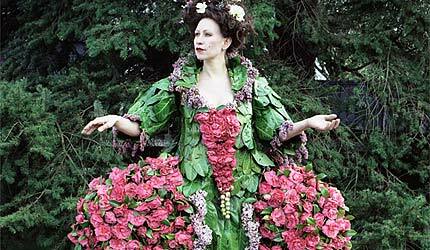 I am particularly impressed with her series of clothing made from plants. For this magnificent series, the concept was to first create a beautiful garment from the renewable sources of flowers and leaves, then to photograph it on a model in both a nature setting and an urban one, and finally, “The third stage consists of a public intervention in a shopping area where the garment wearer engages with passersby regarding issues of disposable consumer goods. The garment/sculpture is later installed in a garden or park setting and left to decompose over time.” Beautiful, thoughtful, and includes the fun of making scenes in public places! Posted by Gothic.net on Tuesday, June 21st, 2011. Filed under Headline, Lifestyle. You can follow any responses to this entry through the RSS 2.0. You can skip to the end and leave a response. Pinging is currently not allowed.